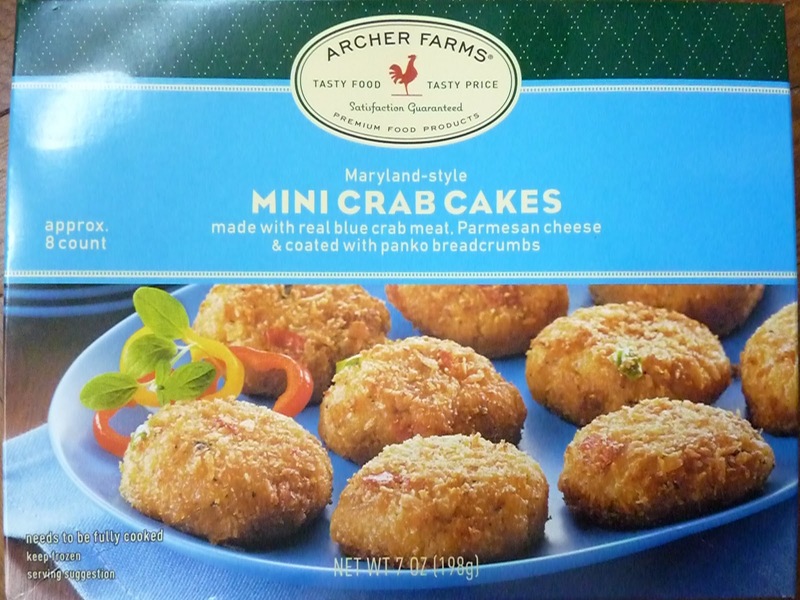 As the packaging for this product suggests, Maryland is the crab cake capital of the world. Specifically, I'd pinpoint the center of crab cake-dom on earth to be Baltimore's Inner Harbor on the Chesapeake Bay. I grew up just 15 minutes north of the Maryland border in central Pennsylvania, and about an hour and a half from the Inner Harbor, so I've had a decent crab cake or two in my day. And if I didn't know the difference between a good crab cake and a "meh" crab cake, I might have enjoyed these guys a little more. But unfortunately, I found them a tad disappointing. I might have written off their blandness to the fact that they're pre-packaged and frozen, but alas, I've had relatively good, pre-packaged, frozen crab cakes. Most disappointing was the lack of traditional crab seasoning. I didn't taste it at all. There are potato chips that taste more like real crab cakes than these things do. absence of the taste of real crab. 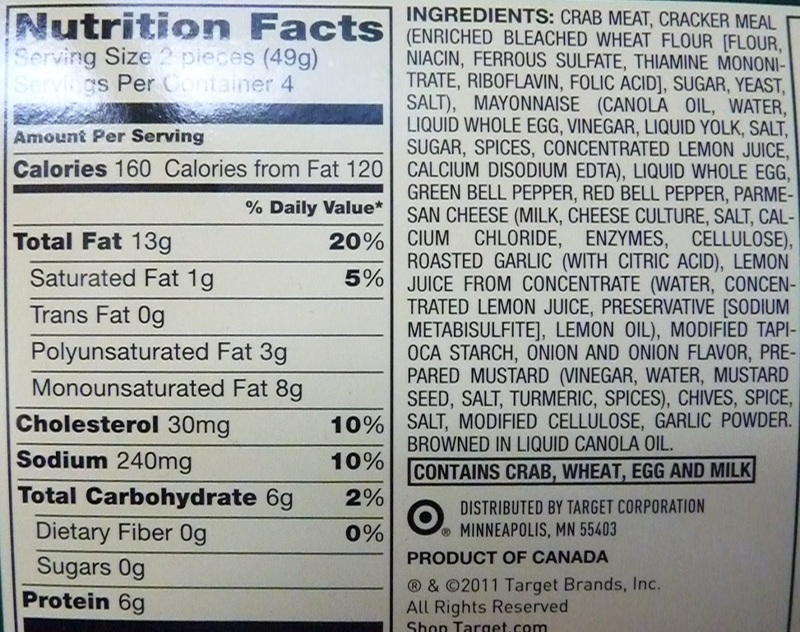 I'm not saying there wasn't any crab in them, I'm just saying I didn't really taste it. All I tasted were some panko breadcrumbs and tiny bits of diced peppers—which, in this product's defense, were fairly good. 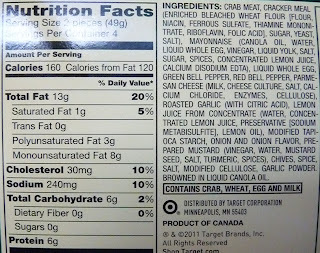 Plus, a sauce might have helped enhance the flavor of these crab cakes: remoulade, tartar sauce, or cocktail sauce. It wouldn't hurt to throw a packet of sauce in there for version 2.0, Target. For those of you who've never had a real crab cake, you probably wouldn't be nearly as disappointed with these as I was. Just don't think that these are necessarily what crab cakes are all about. They don't taste bad, they just don't taste like the crab cakes I know and love. I'll be generous and give this product 6 out of 10 stars. These sound wonderful. I haven't found a place around here though to find lump crabmeat.